We spent two days at the two parks, and there was nothing that tickled me more than Seuss' Landing. 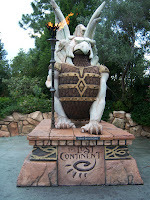 I have to admit we spent too much time there before arriving on The Lost Continent. There were fewer rides here, and I didn't think there was a clear theme. 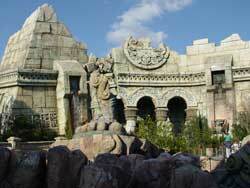 There was a Sinbad stunt show, an intermingling dinosaur - inspired roller coasters, and a Poseidon adventure. It was called Poseidon's Fury, and it caught our attention. It wasn't as much a "ride," as a fantasy - adventure. It was set in a ruined castle. And after walking through dark and winding tunnels, we ended up as part of a tour group. The leader was an assistant, who has lost "the professor," and who accidentally woke up an ancient spirit. It got so intense, at one point Ty said: "Dad, I don't think we should have come in here." Pictures weren't allowed, so I lifted this one from the web site.